This animal pest alert provides information on the identification, biology, and pest potential of the red-whiskered bulbul in Australia. The red-whiskered bulbul (Pycnonotus jocosus) is not indigenous to Australia but it has established small populations here as well as in other countries. It is also commonly kept as a pet here and overseas. The bulbul poses a serious threat to Australia with significant potential to spread further in the wild as populations in Queensland and New South Wales are expanding. It is important to immediately report any found in the wild in areas where it has not been seen before. 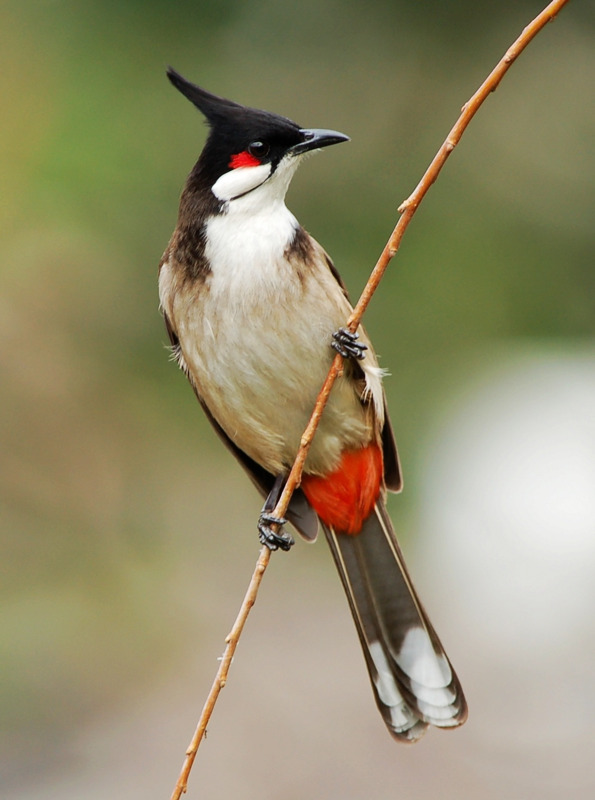 The red-whiskered bulbul is a medium-sized bird 20-22cm in length (body and tail). This jaunty distinctive bird has an erect black crest, prominent white cheek patches and red undertail feathers. The red whisker mark, from which it gets its name, is located below the eye. It has a white belly and breast and a dark brown to black collar extending down each shoulder. The long tail has white tips, and the bird has a pointed black beak. The long (2cm) crest is held upright except when the bird is flying. The immature bird is browner and the crest is shorter. It lacks the red whisker mark and its undertail feathers are pink or tinged orange but it still has the white cheek patches. The calls of the red-whiskered bulbul include a cheerful and pleasant queep-quillya, as well as incessant loud chattering. It is unlikely that the red-whiskered bulbul would be mistaken for any other birds in Australia. However, the indigenous eastern whipbird, which is found in coastal eastern Australia, has a dark crest and is sometimes seen in overgrown gardens hopping through the undergrowth. The somewhat similar non-indigenous red-vented bulbul (P. cafer) was also introduced to Australia (Melbourne and Sydney) and New Zealand but none now remain in either country.